Autumn is nearly here and I have good news, it’s definitely not a wrap for the wrap top that was a huge hit this Summer. You only have to look to the wrap experts Leona Edmiston & Diane Von Furstenberg to see that wrap tops and dresses are always trending. The Wrap top is timeless, sophisticated and suitable for all body shapes so what’s not to love about them? Before we look at my top three wrap tops for Autumn 2018 and beyond, now is great time with a cooler season on the rise to audit your wardrobe. A wardrobe audit gives you chance to assess what you already have that can accommodate the weather changes and any upcoming trend/s. Most importantly it can minimise the urge to race out and impulse buy. If you're not sure where to start with your wardrobe, check out my style support services and please contact me. Fashion trends are rarely born from original designs which is a good thing. It means you can build an adaptable wardrobe that can easily transition across seasons and keep up with changing trends. My blogs aren’t here to persuade you to buy more things in view of a new season. My purpose is to help you create the latest looks with either existing pieces, gorgeous vintage clothing or by helping you select key new pieces that will last for seasons after seasons. With that in mind lovelies, check out my top three wrap tops that I guarantee you will love. Hallelujah - golden brown, chocolate brown and blush browns are the big guns in the colourway this Autumn and Winter. But they aren’t the only hues that are going to steal our hearts as the cooler weather crops up. Look out for baby blue, lilac, blush pink and soft grey. they all compliment those rich earthy tones. 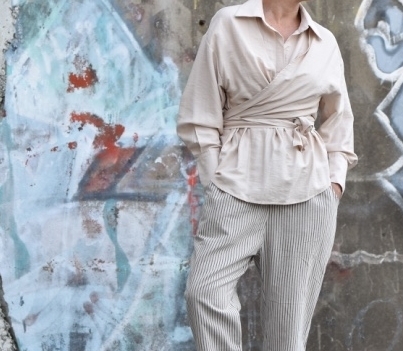 As far as fabric choices go, linen is perfect for a wrap top. it’s lightweight and won’t create any unnecessary bulk around the midsection. Don’t be put off by linen because of the perceived ironing involved. It’s best to iron your linen piece once and then let it soften and yes...crush. This wrap top was made by my dressmaker using Burda pattern 6664 and the linen is from We Are The Fabric Store. Being a size 8-10, I required 2.5 metres of fabric to allow for long ties. The mustard colour looks great with variety of colours from forest green to blush pink, white, black and navy. Because of linen’s luxurious appeal it’s easy to dress it up or down without losing any of its opulence. For a high-end look, pair your linen top with a wide legged pant, a culotte or a pencil skirt and with either with a heel or wedge. For a casual look, the same top looks fab with shorts, a denim skirt or jean and the last thing, finish the look off with a pair white sneakers or platform slides. If you would love to get one made but you’re not sure where to start, please get in touch. Through my styling services I can provide you with access to exclusive dressmakers and private discounts. If you purchased a gingham wrap top recently thinking it would only serve as a fun Summer piece, think again. You can keep this one front and centre in your wardrobe because checks and tartans have come to join the gingham party this Autumn. I picked a red and black check because it’s a classic colour combo and print that has timeless street appeal. Hipsters to housewives and everyone in between can pull this one off. It’s available from Sunday Social and I love the super long ties. You can go crazy with creating lots of different looks e.g for an ultra feminine appearance make a bow or for a relaxed but dramatic style keep the ties long. The ties can also hang at the front, side or back. Checks, gingham and tartans go naturally with denim, white and black. Navy and tobacco shades also look great with a red and black check. red never dates making it a safe and stylish colour choice for a wrap top. If you are looking for more of a “ballerina inspired” look then a neutral colour wrap top is for you. This one is also from Sunday Social and is perfect for comfort lovers seeking an effortless chic look. The sleeve design of the top i'm wearing known as “ leg of mutton” was a massive hit at 2018 New York Fashion Week. it’s no surprise then that same sleeve appears throughout Zimmerman and Scanlan Theodore Autumn| Winter 18 look books. What I love about a neutral colour top is that it can be paired with a pattern like a stripe or you can create a monochromatic look with another neutral shade like I have here. This top can be worn two different ways: knot the ties in the back and wear loosely or wrap them around the front. It is the perfect colour choice for when you need a bit a softness in your day or when you want to look and feel as elegant as a ballerina. Thats a wrap for this blog but not your sustainable fashion journey. Help is here to get you Autumn ready with mindful shopping approaches and sustainable styling. Whether you need a wardrobe reinvention or help shopping for clothes, head on over to my services . Lastly lovelies, If you sign up to my monthly musings and free How To Be A Sustainable Fashionista Checklist you'll receive 25% off all styling services, so what are you waiting for? I would also love it if could share your styling journey with me by mentioning @sustainablestyling and tagging #sustainablestyling.